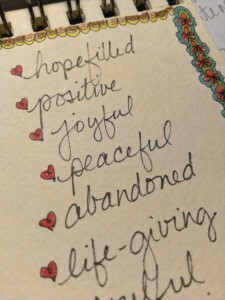 Happy New Year all you Joy Journal participants! I can’t wait to see what word you picked for the new year. 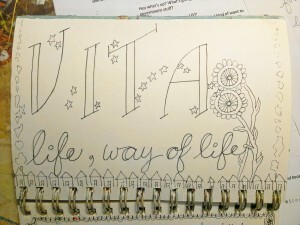 I’m a bit of a Latin nerd, so I chose the word Vita which means life or way of life. I found this word to be perfectly appropriate after the molasses-pour year I had in 2012. While I found myself feeling quite ill most of the year, I also found a wellspring that had not yet been tapped. From it bubbles up all sorts of new life. I look forward to all this wellspring has to offer in 2013. Now to begin. For those of you that have several words and just cannot decide, write your word choices on a piece of scratch paper. Read each word out loud. Now which one does your heart gravitate towards. Go with the first instinct. Let your word choose you. Making this list is almost a form of meditation and appreciation in itself. 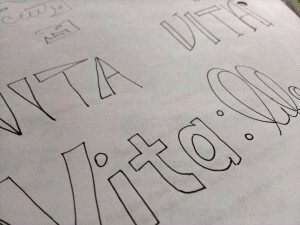 The plan today is to relax and have fun doodling and writing in a fun font style. 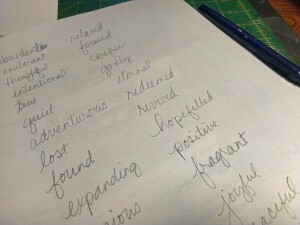 Practice writing out your word on scratch paper in a large way. I suggest using a block-like style. This website is full of very inspiring font ideas. Play with it until you find they style that clicks. 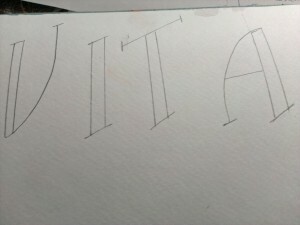 Next step is to write this word in pencil in your journal, and yes, I forgot to add “pencil” to the supply list. I’m pretty certain you can dig one up without too much trouble, but I apologize for the exclusion. Below, I have written out my word, but I then erased the “A” and moved it over a bit. Feel free to use a ruler or straight edge for straight lines and for sizing your letters, but don’t let that perfectionist mindset sneak in and influence your font. Next add the definition of your word somewhere on the page also in pencil. You can use another fun font or the same style. I had fun making this loopy font up. Go over your words with a permanent ink marker or pen when you are done. 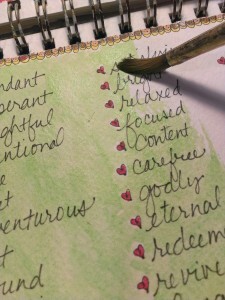 Now add your list of meaningfulness about your word. 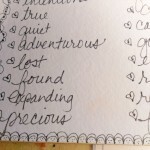 I am a list maker at heart, so I left my list in it’s original column form, but you record your list however you like. You may write in pencil and then go over it with the permanent ink, or you can just write it out in permanent ink. Now it’s doodle time. For those of you that do not doodle regularly, it is time to break loose. 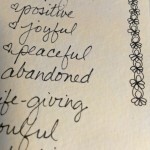 Pull from symbols you may have doodled in elementary or middle school. I had to use hearts somewhere on the page, so I used them as bullet points for my list. Stars and flowers were also a must addition. Zentangling is doodling on steroids. While we will not approach zentangling the proper introductory way in a square, please be inspired and follow instructions from this fabulous zentangling website if you are getting stuck with your doodles. Both of my side doodles are patterns I found on the website. Just keep adding details until you feel satisfied that it is complete. Some will have a very doodly, zentangle-filled page, while others will have much more open space. And now begin to add color. 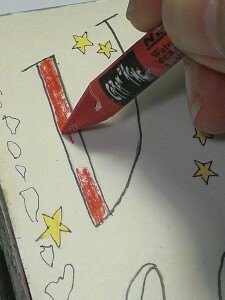 For those of you that did not use a permanent ink/waterproof pen or marker, please use markers when adding color. Otherwise the lines of your words will float and bleed away. 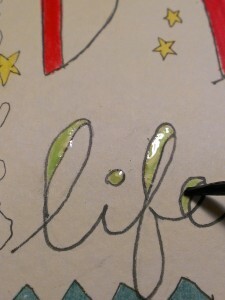 Even with my permanent ink, I had the urge to use my favorite Faber-Castell Pitt brush artist pens to fill in some color for tiny details. 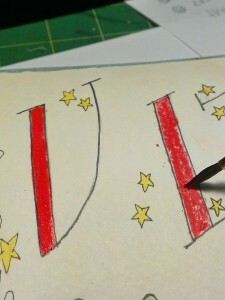 But I also loooove using the watersoluble crayons. (I have Caran D’Ache Neocolor II, but I know there are some other great option out there.) First I colored in some areas. Then I went over the same areas with a wet watercolor brush. Ooo, the vibrant colors! After filling in little details with color throughout the journal spread, I added some watercolor as a background wash. If you choose to do this, remember to paint around the details. Here’s my watercolors. 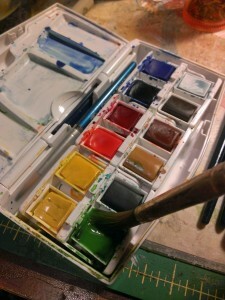 Get the brush real wet so you’ll have nice juicy color on your brush. Paint away! Your paper may absorb the water differently than mine. We are all using different journals with different types of paper. If you find that the water is not absorbing nicely, just blot lightly with a paper towel. I decided to leave some white space on my page, but yours may be filled to the brim with color. I can’t wait to see! Love this Amanda! I spent a few hours yesterday playing with water color crayons and words. So fun and we’re on the same wavelength. That is beautiful and the borders are adorable! I have been really looking forward to this assignment. Thanks for posting. Amanda, what good ideas you have. I like the various mediums you have used. Every year I pick a word as you suggested to help self improvement. 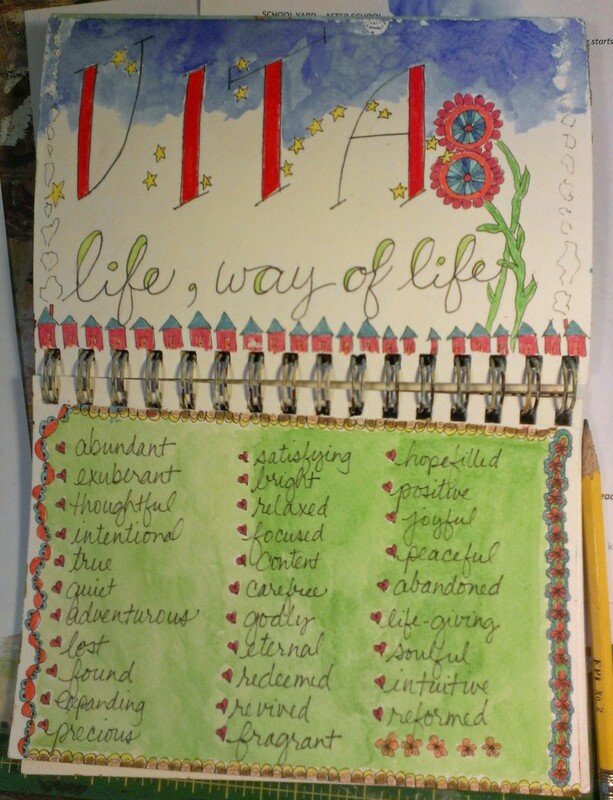 Your journal is colorful and puts the word into you mind better because it is visual. Thank you. My page isn’t completed, but I decided to make a dedicated journal and in a way it is a start to the assignment. I do have a partial page going and notes. 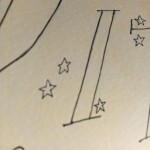 I posted what I have started for my cover on the blog. I LOVE THIS! I have not been keeping up because I have not had the $$$ for the materials, but even I can do THIS! AND I already know my word~HOW EXCITING! 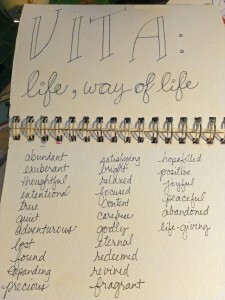 I think I’ll do it on a page and then glue it into the journal I started for 2013. *THANK YOU! * soooo very much!!!! ALWAYS an inspiration, Amanda!!!!!!!!!!!!!!!!!!! !